3 nights aboard the Indian Pacific travelling from Sydney to Perth in Gold or Platinum Service. 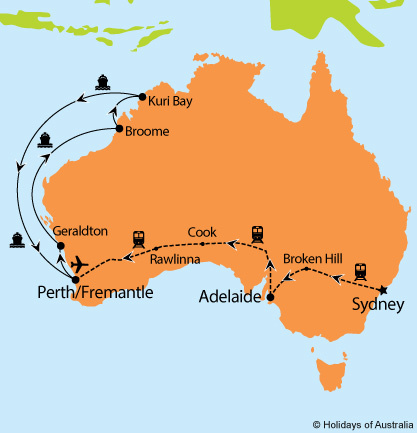 Your journey includes all meals, drinks and off train experiences in Broken Hill, Adelaide, Cook and Rawlinna. One way economy flight from Perth to your closest Australian capital city. Images courtesy of CMV, GSR, Tourism WA, Luke Austin Photography, Shutterstock. *Departures from Hobart are subject to a supplement of $100 per person.